When Apple launched its new entry-level iMac last month, many were happy with the price, but concerned about the system’s notably less powerful hardware. To save costs and simplify production, Apple is effectively utilizing the same chipset in the $1,099 iMac as it does in the entry-level MacBook Air: a dual-core 1.4GHz i5 CPU with Intel HD 5000 graphics (specifically, the Intel Core i5–4260U), and users wondered if this relatively low-end mobile platform was sufficient for powering a large 21.5-inch desktop. Early Geekbench scores revealed both good and bad news. 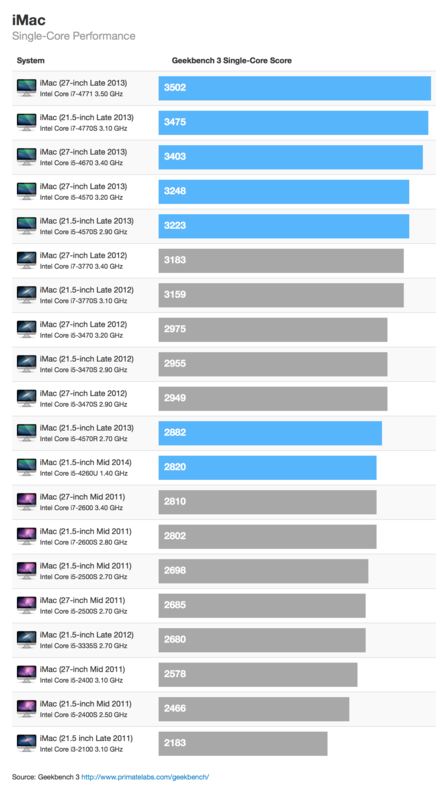 The new $1,099 iMac held its own against the more powerful iMac models in single-core performance (with a single-core performance score about 19 percent lower than the top-end 21.5-inch iMac), as visualized in the chart below, with each iMac model represented by its base price (in USD). But Geekbench scores are only one part of the picture, and “Rob-ART” Morgan over at benchmarking site Bare Feats decided to investigate GPU performance as well. Based on the FurMark GPU benchmark, the results reveal that while the new $1,099 iMac may be sufficient for the basic productivity tasks of consumers, businesses, and educators, you won’t be doing much in terms of graphics on the system’s Intel HD 5000 GPU. As visualized in the chart below, which is based on iMac GPU option, the Intel HD 5000 found in the $1,099 iMac is 60 percent slower than the Iris Pro GPU in the $1,299 model, and 64 percent slower than the NVIDIA GT 750M found in the $1,499 model. The performance gap between this new iMac and the previous entry-level model is not necessarily a bad thing. We all want as much performance for as little money as possible, of course, but it’s likely that very few consumers pick up an entry-level MacBook Air and expect it to be a performance champ. With the same chipset now powering the two systems, consumers will need to adjust their expectations when it comes to the new entry-level iMac, with the benefit being a $200 price cut. So what does it all mean? The $1,099 iMac’s decent single-core performance translates into a more than adequate experience when it comes to basic tasks like word processing, small databases and spreadsheets, Web browsing and email, media playback, and video chatting. In fact, thanks to the single-core efficiency improvements in Intel’s Haswell architecture compared to Ivy Bridge-E, the $7,000+ 12-core Mac Pro only scores about 13 percent faster than the $1,099 iMac in single-core tasks. But those interested in more advanced tasks such as video editing and encoding, photo editing, 3D rendering, gaming, or audio production will want to steer clear of this new iMac model. Despite its attractive price, tasks like those just listed will be handled much better and faster by one of the higher-end iMacs. For professionals for whom time is money, the relatively slow performance of the new $1,099 iMac simply isn’t worth it. For consumers, the extra costs, amortized over the life of the system, make an upgrade to a more powerful model nearly a no-brainer.